JONESBORO – The opening of a small restaurant in the downtown area uses family recipes to bring new customers in. 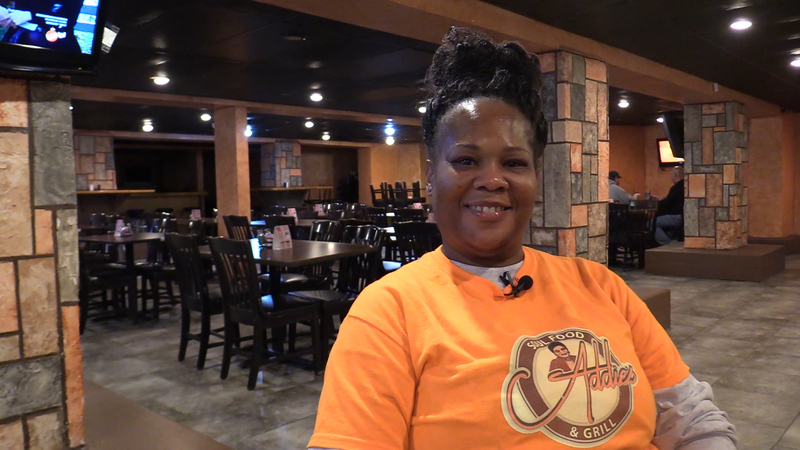 Cynthia Jones, owner of Addie’s Soul Food and Grill, named her restaurant after her mother Willie Addie, who died about 10 years ago. She learned everything she knows from her mother and wants to share her recipes with others. “I always cooked for my family. I come from a family of 10, but I never knew people enjoyed my cooking until I actually started cooking for the church and that’s when I thought ‘Maybe I should venture out and do it,'” Jones said. Many family members work with Jones in the restaurant. A sister, nephew, cousins and friends help out when needed. Lacretia Ray, assistant director of Addie’s Soul Food and Grill and sister to Jones, said family remains important to her. “Cynthia is a very family-oriented person. They push her to keep going. They know she likes to cook and her kids do, too. Her family steps in and helps when they can, so her family, they do a lot. They encourage her a lot,” Ray said. Not only did Jones learn a few recipes from her mother, but so did Ray. “When my siblings eat my food, they say, ‘This reminds me of Mom.’ She left a big impact, so every time they eat they always think of her because they say it tastes just like hers,” Ray said. Among some favorite recipes, Jones remembers her mother’s favorites. “Her favorite recipe, maybe her turnip and mustard greens, and her dressing was probably her favorite,” Jones said. One of the restaurant’s employees working under Jones, Amber Hunter, says the atmosphere reminds her of family. “The sense of family, like it feels like family even though I’m not a part of her family, I feel like I am in a way,” Hunter said. Jones hopes many people come out and try the new restaurant in the community. “My goal is for everyone to come out, enjoy and just try it to see if they enjoy it. Just share some of the recipes and stuff, and if they really enjoy it or not, and tell me what I can do to make it better. It’s just for the community. I enjoy to give to people,” Jones said. Hunter said she plans on working at the restaurant for Jones in the future. “Working for someone like Cynthia is amazing. You’ll see me here for a while,” Hunter said. While the restaurant’s soul food cooks, it can be smelled from blocks around in the downtown area.